Spawforths worked on behalf of PXP West Midlands Limited's Partnership for Brindley Village II - a residential-led mixed use scheme, providing 193 new homes and enhanced community uses. Embracing a substantial area north of Birmingham’s canal network, the scheme is an ambitious project brought forward in partnership with the Homes and Communities Agency and Urban Living, the Housing Market Renewal Pathfinder for Birmingham and Sandwell. The development will re-establish Smethwick’s canals at its heart, delivering waterside living together with recreational, leisure and community facilities. The development proposes enhanced pedestrian and cycle linkages and will also deliver environmental improvements through utilising brownfield land and enhancing the landscape whilst respecting conservation interests. 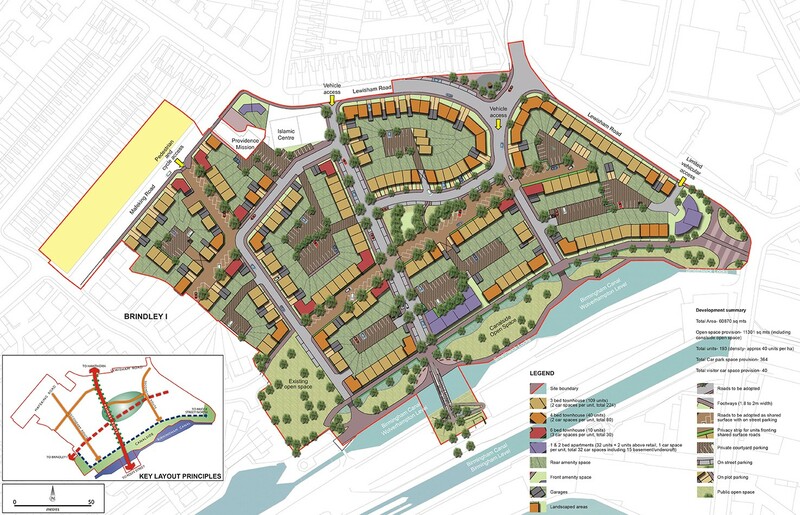 Outline planning permission was granted at planning committee in May 2009 following positive pre-application discussions with CABE and Sandwell Metropolitan Council. Spawforths worked closely with a team of consultants to discharge pre-commencement planning conditions and remediation of the site has commenced on site.